Another early morning, another local bus to catch. This time though we had to walk with our backpacks on for quite a while, to the bus station and back, being unable to find where the bus was picking us up. We went to the bus station while the bus went to the hotel. Finally we found each other and, with Chocopie provisions, another half a day passed before we arrived in Udaipur. However, whilst until now we traveled mostly though desert, now we were crossing mountains and forests and we could see lots of monkeys jumping from tree to tree or just hanging around by the side of the road. 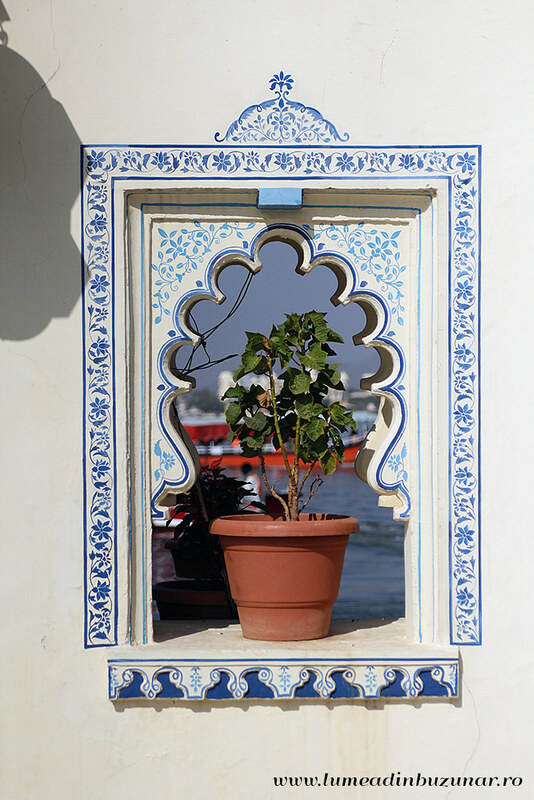 Udaipur is a beautiful city which surrounds part of Pichola Lake. It’s famous for the Taj Lake Palace, a luxurious five star hotel which covers an entire island on the lake. Udaipur is a very popular touristic destination and that’s why most of the Palaces have been converted into luxury hotels. The city centre itself is small, with narrow streets, many leather shops, and white buildings. 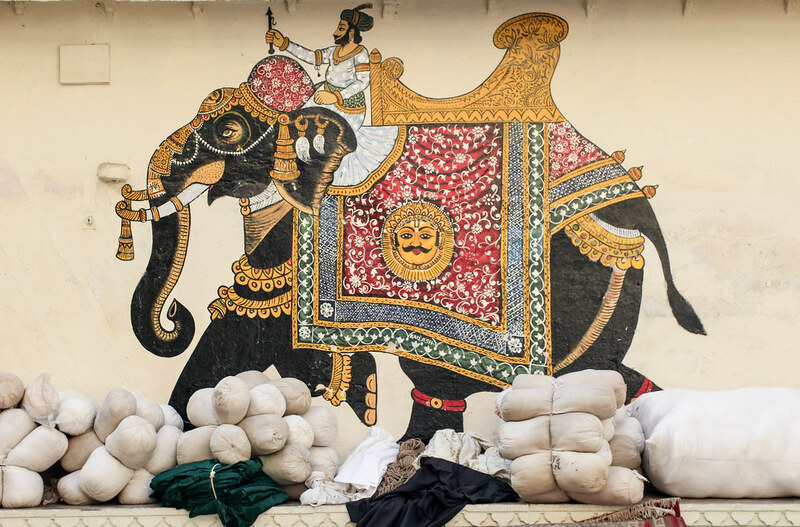 If you wonder around the mazy streets you will encounter lots of people inviting you into their shops, to see how they paint elephants, camels and horses on silk and buy their work. The town has a certain charm, it’s different than the ones seen before. For some reason, here things don’t seem to be that pricey for tourists and also people don’t insist that much to drag you in their shops to buy something. We spent the remaining of the afternoon having an informative tour of the city and I went through some scary moments when the ATM refused my card. I spent lunch between eating some “western food” (can’t remember what) and being on the phone with HSBC due to them making a “small” error, mistakenly my debit account with my credit one. The sun was about to set when we got to the Gangaur Ghat, to watch it. Soon after, we rushed to the Bagore Ki Haveli for a traditional Rajasthani dance show. We had special seats, above the scene, as we were a bit late. 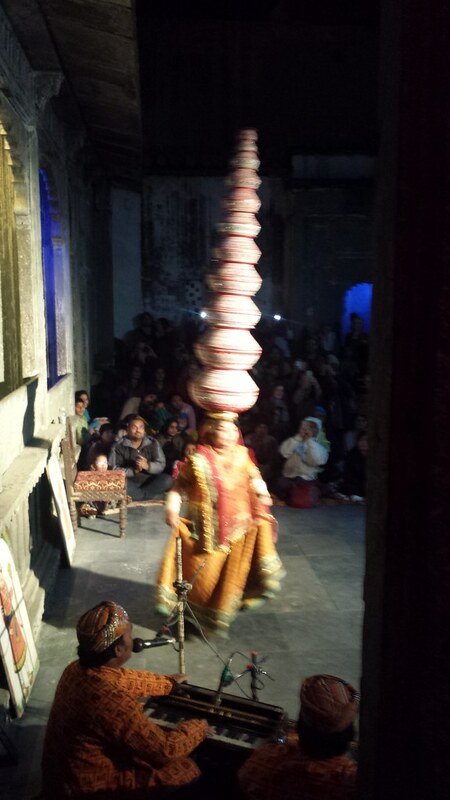 The performance was stunning, ending with a woman carrying on her head no less than 11 pots! We had dinner in a rooftop restaurant with a beautiful view above the lake and after we returned at the hotel. The next day was free for exploring. 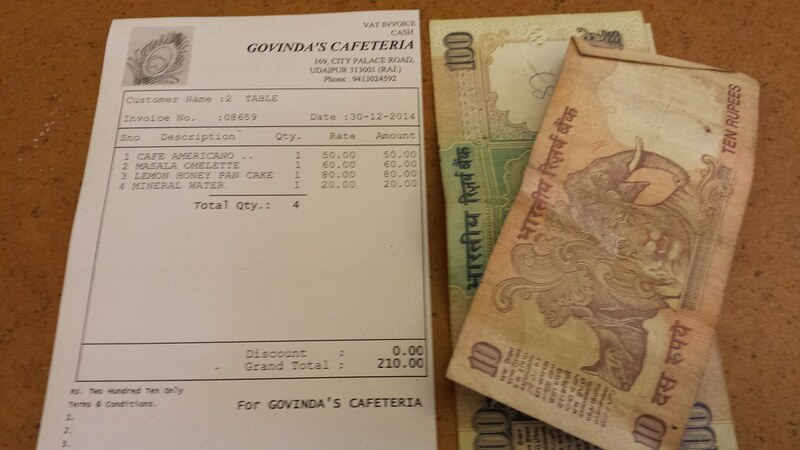 We all had breakfast at Govinda’s Cafeteria, a small cafe near the City Palace. 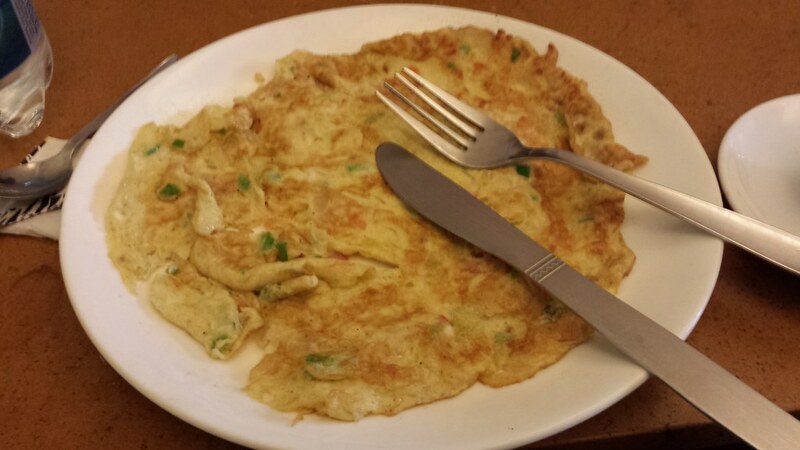 Now let me tell you, if you didn’t have masala omelet at least once in your life, you don’t know what a good omelet is! I was hungry so I went for a masala omelet, a honey and lemon pancake, a proper coffee and a bottle of water. The price for all this? About £2. Taste? Delicious! After breakfast we started our boat trip on the beautiful Pichola Lake. We passed through the impressive gates of the City Palace and heading down, through the gardens, to the boat docks. Even if it was sunny, the area was still surrounded by a thin, white mist. 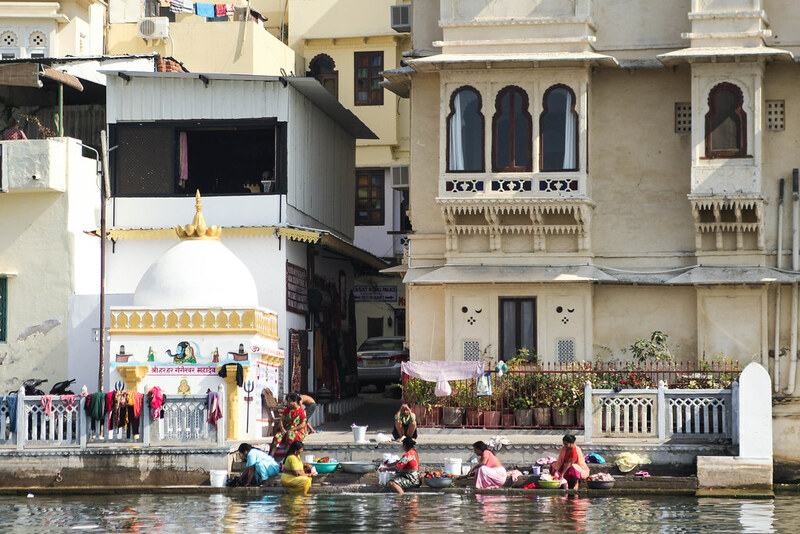 We have been given life vests and hopped on the tiny boat, towards the beautiful Jag Mandir. The boat was sliding slowly on the surface of the water, while daily life bits were passing before our eyes: women doing their washing up alongside tourists gazing at the lake panorama, kids bathing and playing in the water. The architecture of the town is impressive, whit white tall blocks of columns, carved windows and cupolas. 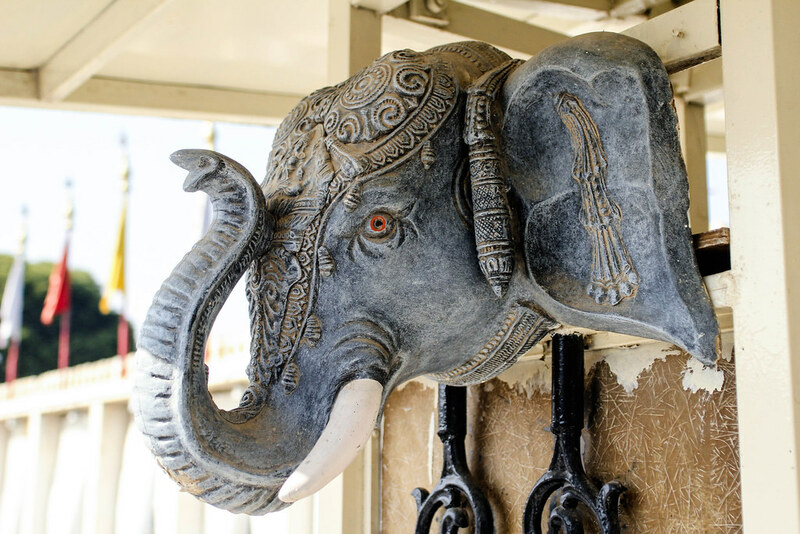 Jag Mandir is a palace built on a natural island, and it’s entrance is guarded by eight elephant sculptures. It faces the City Palace and has a landing jetty, for the boats to dock on. Tourists are allowed only in the Courtyard, the rest of the Palace being converted in another luxury hotel. But even so, the trip is not disappointing. 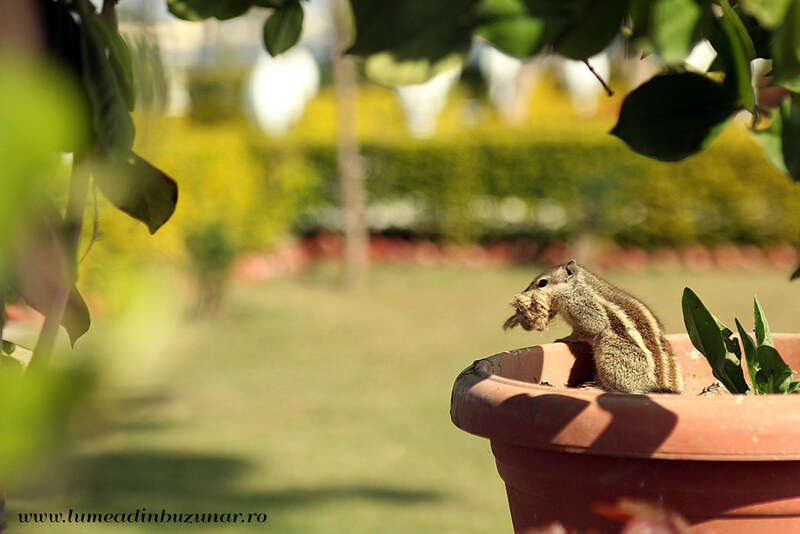 Half of the entrance courtyard is covered by a beautiful garden where both flowers and small animals live. 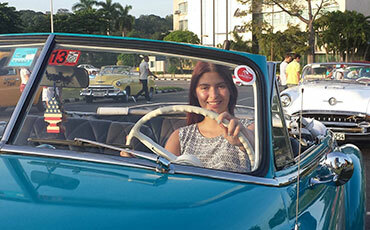 Because it was a free day, our big group split – each going towards different activities. I remained with John to go in a more in depth visit of the City Palace, followed by a relaxing cheap and very relaxing massage (250 rupees – £2.5). A girl no older than 14 took away all the tension in my back muscles, after all those days of carrying the backpack. Later, I joined a yoga class, recommended by Lonely Planet. It was the first time I was doing yoga and I liked it. The instructor took time to explain how to do each pose and more important, why doing it that way. And I have to say, with this class in mind, after coming back to the UK, I started to go to Body Balance classes – which is a combination of yoga, tai chi and Pilates and I applied the knowledge I’ve learned in India. The rest of the afternoon we wondered around, stopping by Govinda’s Cafe again for dinner. I have to mention that Udaipur is also famous for the miniature painting. There are a lot of artists that will paint on silk, old paper or even on your nail. There are a lot of art schools and painters that will teach you about this form of art. Unfortunately I didn’t take any pictures of this. Looks like a very interesting place to visit. Everything is picture perfect. In love with your photography! So amazing! Made me feel like i’m actually there. This place is just amazing. Those pictures are really wel taken! They look so professiol. I love that picture with the pigeons! Well done. 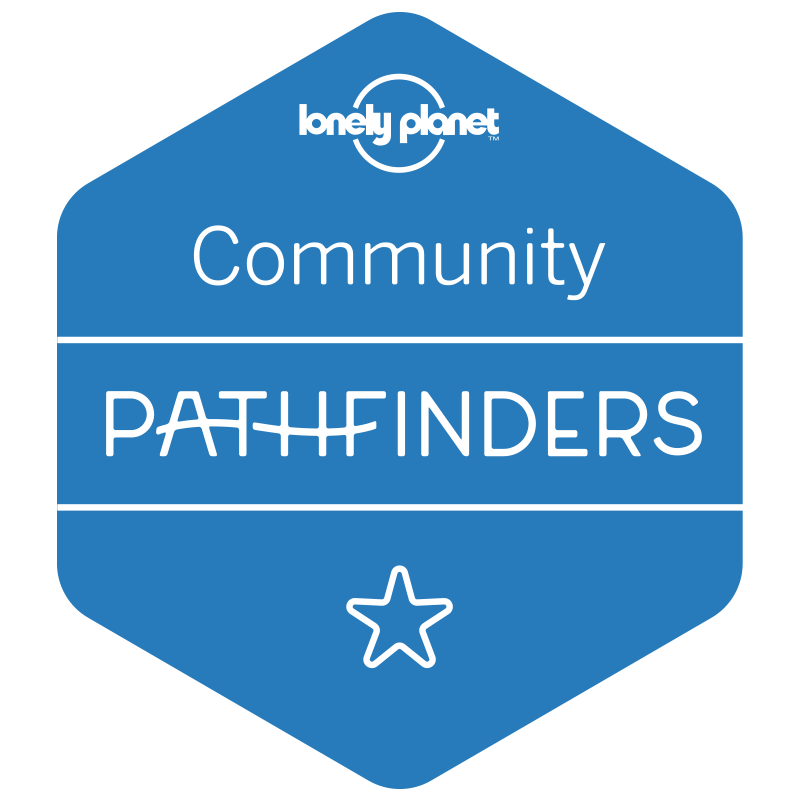 Great to have a look into this world through a blogpost here! Indeed it’s an amazing place. 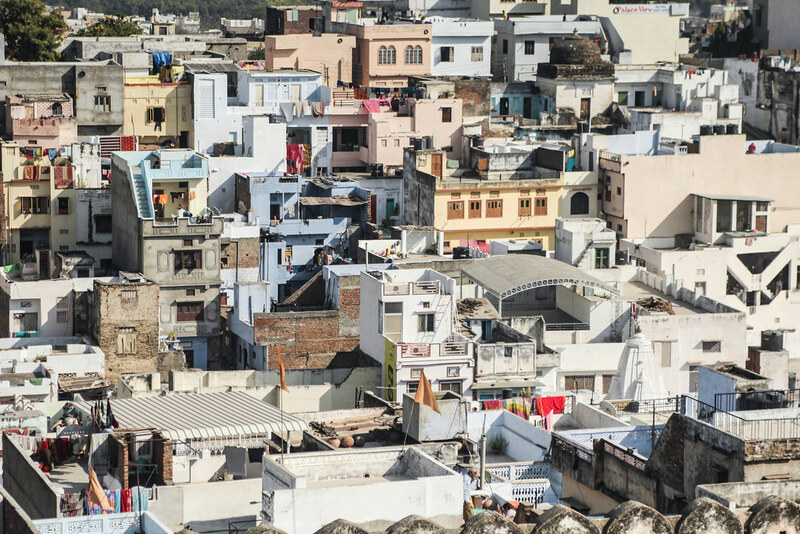 It looks so different than the rest of Rajasthan, maybe it’s because of the blue and white colors that dominate the sight. Stunning photography! Love reading about your journey. I would love to travel the world, too. What other places have you visited? Thank you for your comment! I think your country is very interesting and both the culture (with the beautiful architecture and the spiritual believes) and the poverty (the slums) make India such a contrasting unique place. Looks like a beautiful place to visit and explore especially if into photography. Photowalks are popular here in my country and photographers go together to capture photos. Wow yoga is definitely of the things I want to try. I get so restless and stiff on a daily basis. Beautiful pictures! I want to go to India too.It’s been a while since I’ve done yoga.Yoga is one of those things that make me feel like myself. Breath taking photos! LOVE LOVE LOVE!!! Your photography is AMAZING! Everything bounced out at me and made me really want to go there. Beautiful. 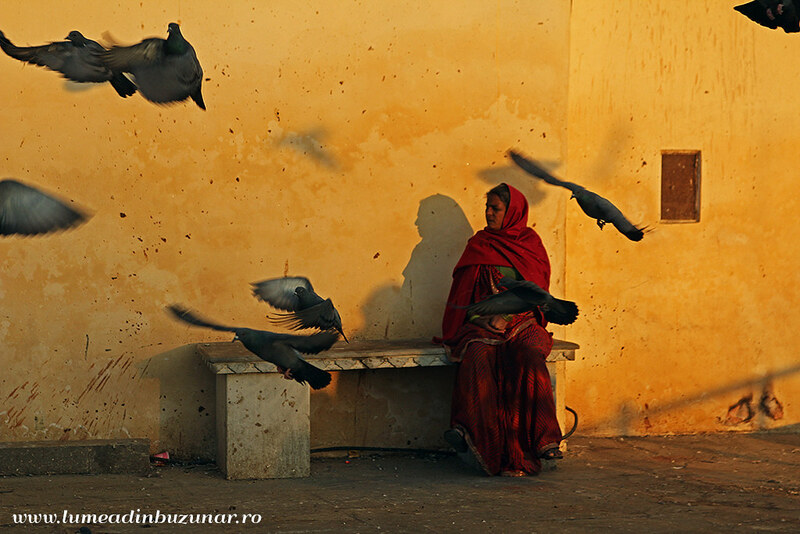 You know while reading this post, I thought about how it would feel to read while sitting beside the lady with the birds flying around. India’s not in my list to visit honestly, but reading this and seeing the pictures, i think i should include visiting this place! I simply love udaipur. It is so rich with the heritage and it’s traditional roots. This is very interesting. I love the post. So informative and the pictures are beautiful. Looking forward to your future posts. I am currently back reading the older ones. You always amazes me with your pictures. it’s so lively! Then the stories you tell it’s just simply beautiful and amazing. Wow 11 pots?haha that looks cool. I had fun reading your post, it feels that like I was with you experiencing all these stuffs. Good post!! Udaipur is a part of our country’s heritage. Which would lead me to suggest you to visit rishikesh and gangtok if possible 🙂 Have loads to see and experience in these places. This looks and sounds like an amazing experience and a great place to visit. It’s awesome that you did the yoga there for the first time. 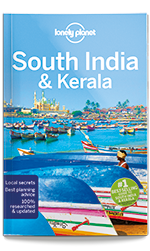 Lonely Planet recommends great stuff sometimes. Love your pictures. I have tried yoga back in the UK and I found it too difficult. I can’t breath properly and all that breath control almost left me without air. I preffr Body Balance, which is a combination between yoga, pilates and tai chi. I can recommend it to you, it’s really relaxing and stretches all your muscles in a good way. Wow! These pictures are fab! You’ve made me really want to go there! I’m due a holiday! Fab post! Your photography is amazing! Never been here but will add it to my list when I travel later on in the year. What a fun place to visit. I love that woman with the 11 pots on her head! You really do a great job at sharing a cool place and wanting us to come there! What great photos! makes me want to go visit someday, thanks for sharing your amazing experience with such detail too! I didn’t have the chance to go to Udaipur, but I’ll definitely go next time I am in India! Amazing pictures as per usual! I’d love to have a miniature painting on my nail, that would be really cool! I adore these photos. This is a very nice place. The photos are absolutely amazing! You really captured their culture. I’m going to keep this in mind if I had a chance to visit India. Such a different place compared to where I live. Always find it amazing how different countries are all over the world yet we are all human. The buildings are beautiful. Your photography is stunning! Udaipur is at the top of my list if I ever return to India, but I wonder about that bus ride. It seems so far away from everything else. I’d be interested to know how you built it into your itinerary. 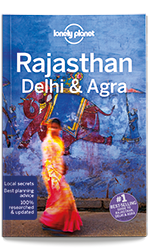 Were you already hanging out in Rajasthan? 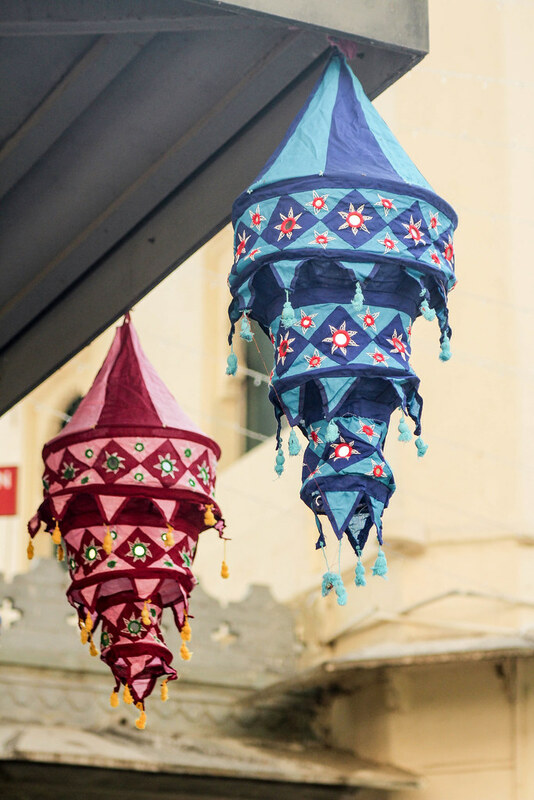 Udaipur looks rich with culture! I would love to visit someday and experience this in person. Lovely photos. Looks like an exciting adventure! Your photographs are beautiful! I enjoy taking boat tours of cities, it gives another dimension and shows another side of it’s beauty. And, love the idea of getting a massage! I am Indian and have not been here ! 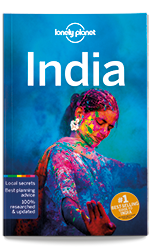 Looks so fun and amazing – I have always wanted to go..
Lovely photos and it made me want to visit India more! It is one of those exotic places that always intrigued me – and I don’t even want to start talking about the great food! Did you go there with a friend or just did the entire trip by yourself? I had an Indian friend (but he didn’t grow up in India) sort of warned us not to go there without somebody local. 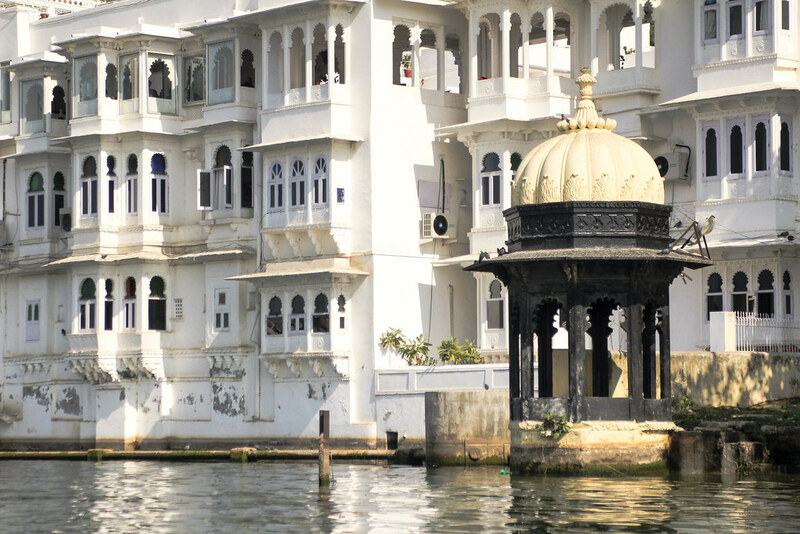 Udaipur looks beautiful – I love that you can take a boat ride to explore the area. And the sunset looks just magical. I would love to eat at the rooftop restaurant with the lovely views! Love all these pictures! You know, I am from India but am yet to explore Rajasthan as an adult. I go to India once every winter and event hough I always want to see a new place, time just flies by in meeting relatives, visiting grandparents,chilling at home etc. I really want to go to Jaipur,Udaipur,Jaisalmer,Ranthambore and more! Jag Mandir palace caught my attention! The photo of the sunset with pigeons or birds is nice. I like your detailed story telling. Keep up. I have always said I will try yoga some day! How was that yoga experience? 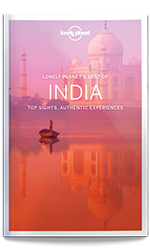 India is so high on my list- this post makes me want to visit asap! I love the way you write, it paints a picture but is also to the point, which makes it really easy to read and take in! Thank you! Also your pictures are amazing! !